Hello everyone! As we approach finals and graduations, many of us are becoming more anxious and stressed. We start to fear deadlines, assignments, tests, etc. This week at Neuroscience Axis we will be talking about the Neuroscience of Stress. 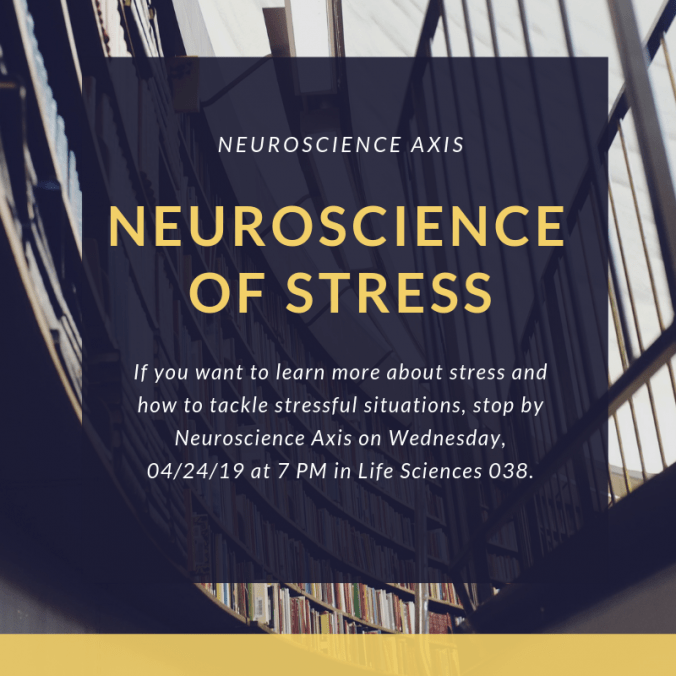 If you want to learn more about stress and how to tackle stressful situations, stop by Neuroscience Axis on Wednesday, 04/24/19 at 7 PM in Life Sciences 038. Also, at the end of our meeting we will be making stress balls to help us study for the finals. This Wednesday, the Neuroscience Axis is hosting a special conference to raise awareness of war and its effects on mental health of veterans, civilians and refugees. Amazing SBU neuroscientists and medical doctors who specialize in mental health research will share their perspective on the physical and biological risks of long lasting effects of war-related events and explain the latest findings from their studies. 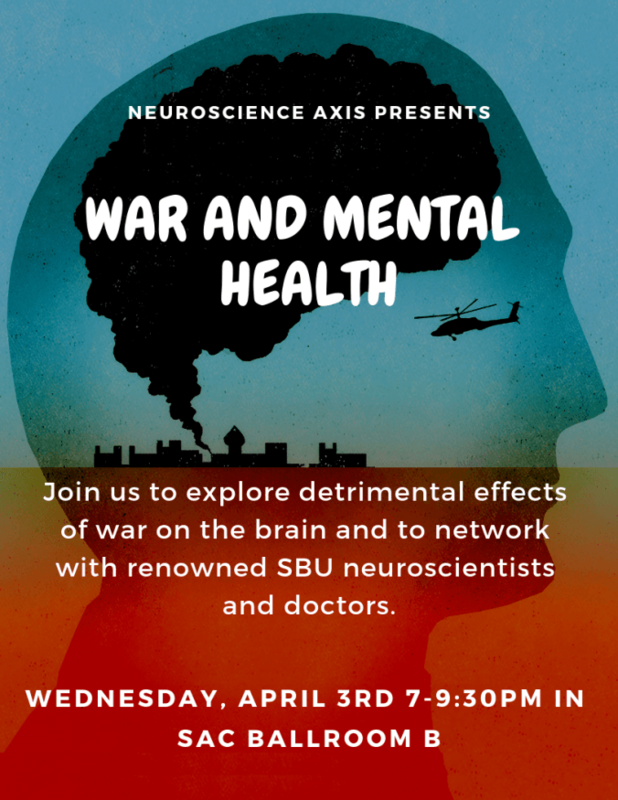 Join us this Wednesday, April 3rd 7-9:30pm in SAC Ballroom B to network with renowned SBU researchers, discover new research opportunities and learn more about Neuroscience of War! The Neuroscience Axis is hosting a special conference to raise awareness of war and its effects on mental health of veterans, civilians and refugees. Unfortunately, people who undergo an extremely traumatic sequence of events tend to develop psychological and often neurological disorders such as post-traumatic stress disorder (PTSD). Amazing SBU neuroscientists and medical doctors who specialize in mental health research will share their perspective on the physical and biological risks of long lasting effects of war-related events and explain the latest findings from their studies. Join us on Wednesday, April 3rd 7-9:30pm in SAC Ballroom B to network with renowned SBU researchers, discover new research opportunities and learn more about Neuroscience of War! Hi everyone! As we approach the middle of this spring semester, research laboratories are opening up. As seniors graduate, this is the perfect time for you to apply to labs and get your foot in the door. 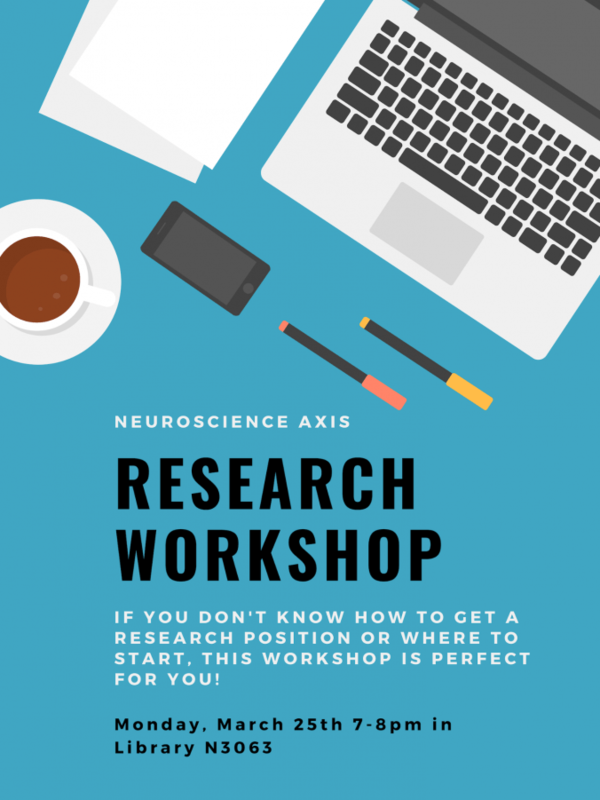 In order to ease this process, Neuroscience Axis will host Research Workshop this Monday, March 25th 7-8pm in Library N3063. We will start off the event by going over some of the key components of applying to labs. Then, we will have a one-one-one session with everyone to answer everyone’s questions. If you need your resume checked, help finding labs of interest or even check over your email to a professor, bring them over and we will help you with the process. No question is settled until it is settled right. So bring over your questions and Neuroscience Axis will help you. We are looking forward to meeting you all on Monday! Are you interested in pursuing a career in medicine? Do you want to learn more about neurology and other related fields? 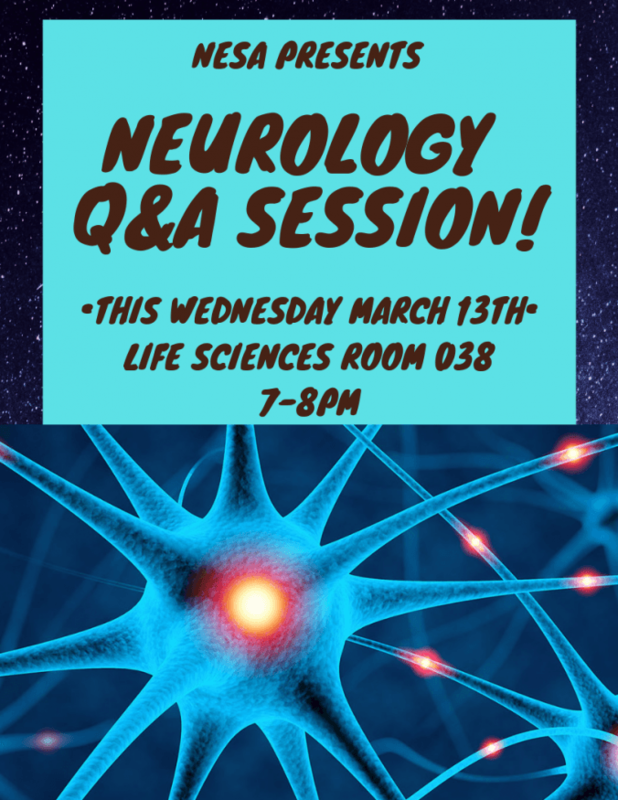 The Neuroscience Axis is hosting a neurology Q&A session, in which we will be asking Dr. Benjamin Blond, a Stony Brook neurologist about his career and his path to medicine. Following the session, we will be hosting a Brain Awareness training, in which we will be preparing to visit schools on Long Island to increase knowledge and exposure to neuroscience. Join us on Wednesday, March 13th from 7-8PM in Life Sciences 038 to learn more about the field of neurology and medicine! Hello everyone! Do you want to learn more about endocannabinoids and what roles they play in our brain and body? Wonder what more there is to the endocannabinoid system than just cannabis? Then this week’s GBM is for you! This week, Dr. Martin Kaczocha, whose research includes endocannabinoid lipids, will be giving a lecture for this week’s GBM. 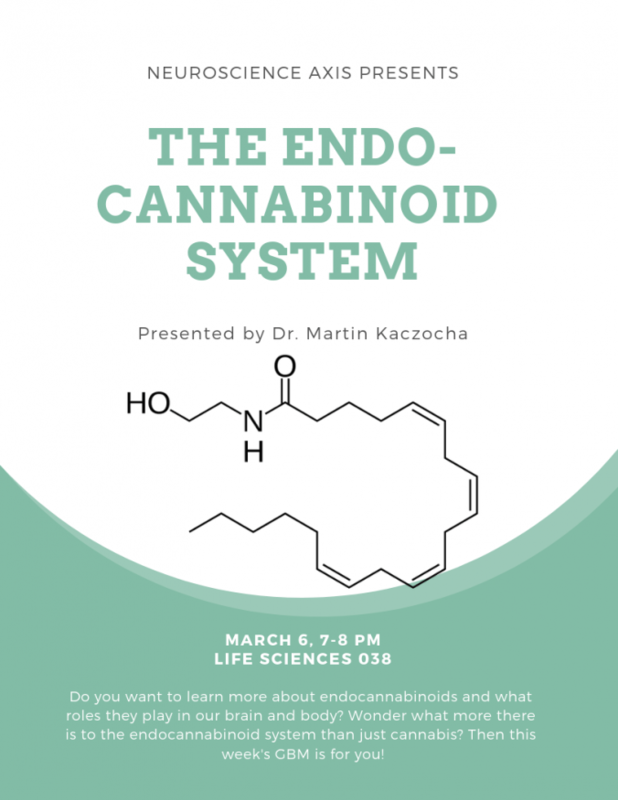 Come by this Wednesday at 7 PM in Life Sciences 038 to learn more about the endocannabinoid system! Hi everyone! 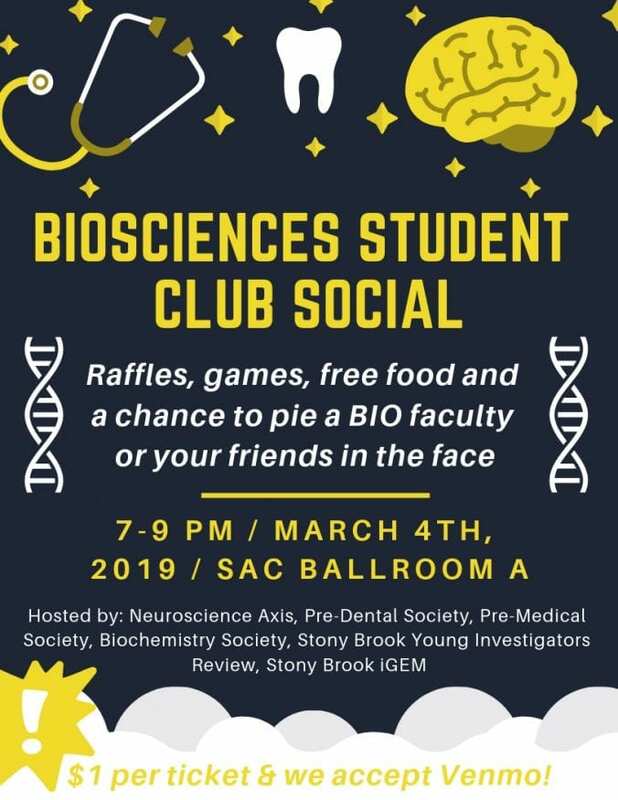 This Monday, the Neuroscience Axis, SBYIR, Pre-Dental, Pre-Med, and Biochem societies are hosting the annual BioSciences Student Club Social. There will be games, free food and raffles where you will get the chance to win MCAT/GRE prep materials and more! You can also win the opportunity to pie a bio faculty or your friend in the face. Join us on Monday, March 4th from 7-9pm in SAC Ballroom A to show your support for the biosciences! Hey guys! Since there will be a Healthcare, Research and Human Services Job and Internship fair this week on Friday, March 1st from 12-3PM, we will be having a resume review for those who are interested. We will be hosting Urszula Zalewski, the Director of Experiential Education who focuses on jobs in Healthcare and Medicine. 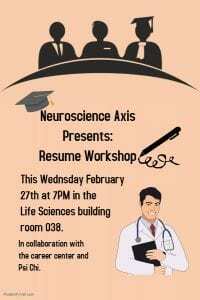 Along with Psi Chi honors society, she and eboard members of the Neuroscience Axis will sit with you and give you tips on how you can improve your resume! Good luck and hope to see you there! Are you interested in pursuing a career in medicine? Do you want to learn more about neurology and other related fields? 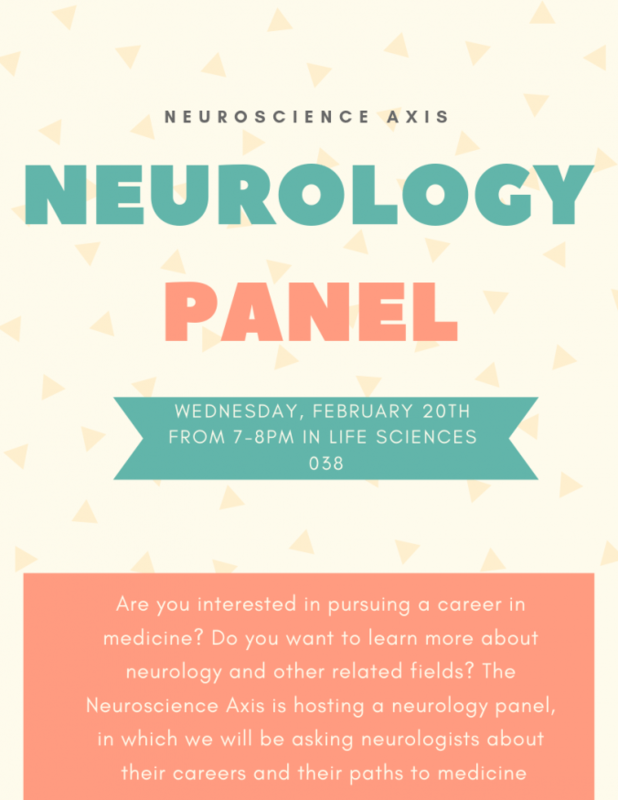 The Neuroscience Axis is hosting a neurology panel, in which we will be asking neurologists about their careers and their paths to medicine. Join us on Wednesday, February 20th from 7-8PM in Life Sciences 038 to learn more about the field of neurology and medicine! Hi everyone and welcome back! We hope your Spring Semester is off to a great start. We are hosting our first general body meeting this upcoming Wednesday, February 13th from 7 to 8pm in Life Sciences 038. 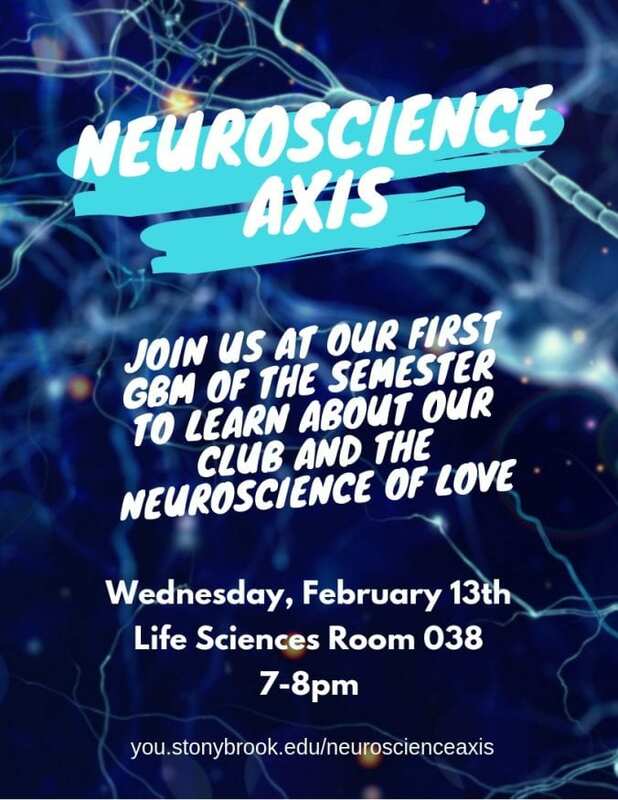 Join us to find out more about our club, meet our eboard and learn about the neuroscience of love. We are also going to be at the Spring Involvement Fair from 1 to 2:30pm on Monday, February 11th in SAC Ballroom A. If you are interested in being a part of our club, stop by our table to talk to our eboard members and discover what Neuroscience Axis is. We are looking forward to seeing you all soon! Subscribe for weekly NeSA updates!